The Side view is used mainly for multiplane scenes and to position elements in 3D space. It allows you to see a scene’s stage from the side. This lets the camera cone and spacing between the elements to be seen. A thumbnail of each drawing layer in the scene. The order of the thumbnail images is based on each element’s FB position in the scene space. You can see a representation of the FB position of each layer in the camera cone. The camera cone represents the camera’s position and field-of-view (FOV). There are two view option buttons displayed in the lower-left corner of the view. ‣ Show/Hide Camera: Shows or hides the camera frame in the Perspective view. ‣ Reset View: Resets the pan, rotation and zoom of the Perspective view. This field displays the current zoom level in the Perspective view. You can use the Zoom menu to select a zoom level from 2.5% to 6400%. You can also select Fit To View to automatically use a zoom level that lets you see all of the scene layers and information in the Perspective view at once. Displays the currently selected layer and drawing name. Displays the currently selected tool. 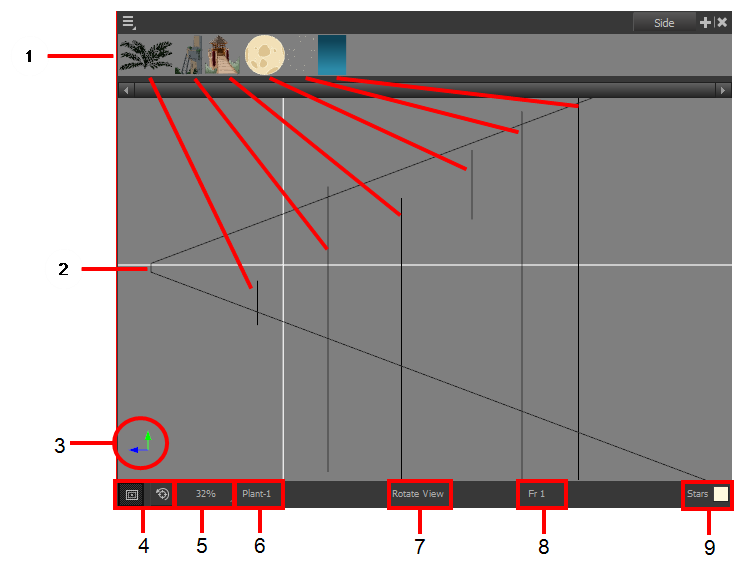 Displays the currently selected frame of your animation. Displays the currently selected colour in the palette.